If you have hardwood trees – particularly oaks or aspens – on your property and live any of the states of the Northeast or in Virginia, North Carolina, Ohio, Pennsylvania, or Michigan, you need to keep an eye open for the destructive gypsy moth (Lymantria dispar). The tree-infesting moth has been described by the U.S. Forest Service as "one of North America's most devastating forest pests" and by Penn State University Extension Service as "the most important insect pest of forest and shade trees in the eastern United States." But they don't just attack trees in forests, the larvae (caterpillars) can defoliate and kill shade and ornamental trees in urban areas and yards. And they can be quite a nuisance as they crawl around patios, decks, and lawns, leaving debris from their feeding. As its name indicates, the gypsy moth is not native to North America: It was introduced in Boston in 1869, widespread across Northeastern states by 1902, and firest detected in Pennsylvania in 1932. Its introduction is actually rather interesting: Etienne Leopold Trouvelot was a Massachusetts portrait artist of the 1800s who collected and identified silk worms that could be used to produce silk. But in the late 1860s, he brought gypsy moth eggs home from France, and cultured them on trees in his backyard. When some of the larvae escaped, he notified local entomologists … but nothing was done. Within a few decades a gypsy moth infestation broke out in his neighborhood, and began to spread. Although the state attempted a number of control methods, the infestation continued to expand. And the rest, as they say, is history. With the extensive numbers, the moths can completely defoliate trees, then leave them susceptible to attack and death by secondary pests such as the two-lined chestnut borer and organisms, such as shoestring root rot. And because it is not native to the Americas, it does not have many native predators, enabling its populations to soar. Although the gypsy moth is currently found primarily in the areas listed in the first paragraph of this article, but every year, isolated populations are discovered in new areas, and the Forest Service sees it as inevitable that it will continue to spread over the next century. 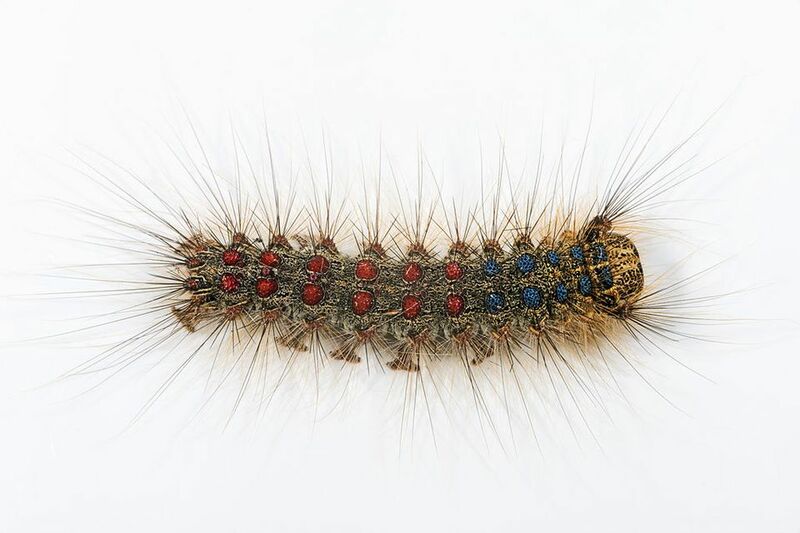 The gypsy moth larva/caterpillar is fairly easily identified by the five pairs of blue dots and six pairs of red dots on its dark-colored back, that is covered with hairs. It is present – and spreading its destruction – from spring to early summer. The adult female is tan with whitish/cream-colored wings. Although it has a 2-inch wingspan, it cannot fly. The male is darker in color and slightly smaller than the female (1.5-inch wingspan). It does fly. Both the male and female adults are also identifiable by the inverted V coloration on their wings. After entering a pupal stage in early to mid-summer, adults emerge and are present from July into August. During their brief two-week lifespan, the adults will mate, and the females will lay 500 to 1,000 eggs on branches, tree trunks, beneath bark, and in other sheltered locations. The egg masses, which are off-white to white, about 1 1/2 inch by 3/4 inch, remain dormant over winter, to emerge as larvae in the spring when hardwood trees begin to bud. Freezing temperatures below 20°F will kill gypsy moths and their eggs, but many egg masses can survive even harsh winters when they are covered and insulated by snow. While many of the states in which gypsy moths have been detected have programs to reduce populations and try to slow their spread, homeowners can help in this effort. Following are recommendations that will help protect trees on your property, and help in slowly the overall expansion of gypsy moth populations and geography. Know what the moth's egg mass looks like, then regularly inspect trees and destroy any that are found. When traveling in areas that may be infested with gypsy moths, always inspect your vehicle and belongings for egg masses, larvae and moths, and remove them. Do not transport firewood across distances. Always buy it locally when using for a home campfire or fireplace. When visiting a campground, wait to buy wood near the site, then leave any you do not burn, do not take it home. Use tree bands or other pest barriers on the trunks of susceptible trees to help keep larvae from moving onto or off the tree. This is particularly important if the gypsy moth caterpillars have been detected on your trees or in your neighborhood. Although only the gypsy moth's larval stage causes damage – as the adult moths do not feed during their short lives, reduction and elimination of the adults, and destruction of eggs, will help to keep populations from growing. Adult males can be captured with pheromone traps, reducing the ability of the population to reproduce and grow. If your trees are under 12-feet tall, you can apply an insecticide product that is registered for gypsy moth control. The University of Wisconsin Extension Service provides a great chart that lists the active ingredient, application timing, and attributes of some of the most common of these. This chart is available at http://learningstore.uwex.edu/assets/pdfs/FR-171D.pdf. The State of Pennsylvania provides a similar chart on its "Homeowner's Guide to Gypsy Moth Management"; the chart is on page 15 of the pdf located at http://www.dcnr.state.pa.us/cs/groups/public/documents/document/dcnr_20026635.pdf. When using any pesticide for any purpose, always thoroughly read and follow all label directions. If your property contains larger trees, or you would prefer the work be done by a professional, you can hire an arborist or certified pesticide applicator.